You probably know the story: two young men, William Harley and Arthur Davidson, built their first "motor bicycle", back in 1903. It was essentially a small, 116cc motor attached to a bicycle frame. 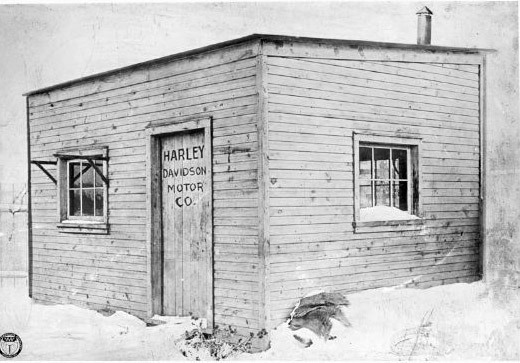 The first factory where they began their journey into motorcycling history, was likewise a small, 10x15-foot shed located on what would become Juneau Avenue. Today, it's the head office of the Harley-Davidson Motor Company. Within a few short years, production had moved into a bigger building and the company had grown to have six employees. William and Walter Davidson both joined the company, and Harley-Davidson was incorporated in 1907. Over the next decade the company continued to expand, with many of the motorcycles produced for the American military, involved in World War I. Not all changes were for the best, however. In 1965, Harley-Davidson went public, and eventually merged with American Machine and Foundry in 1969. Under the AMF banner, production was ramped up, but quality control suffered, leading to many of the stories of poor craftsmanship of the Harley-Davidson line. Eventually, a group of executives, including members of the founding families, bought out AMF in the early '80s and once again, Harley-Davidson was on its own. Since then, the Harley-Davidson brand has become a classic American icon. While the core of the lineup retains classic styling that harkens back to the early '30s, the company has shown they are not afraid of trying new things. Both their V-Rod lineup, and the highly-experimental Project Livewire, Harley-Davidson's first electric motorcycle, show that the Eagle is not afraid of flying into unchartered territories. Note: Most of the information found within this section was culled from Rick Conner's excellent Harley-Davidson Data Book. Pictures of the motorcycles were found on the web. If you have a clarification, request, or need a picture removed due to copyright, please let me know. It'll be taken care of ASAP.